In Vinhos (a Portuguese word meaning “Wines”) you will play the role of wine producers in Portugal. Over a period of 6 years, you will expand your business by establishing Estates in the different regions of Portugal, buying vineyards and building wineries. Skilled enologists will help you increase the quality of your wine, while top Wine Experts will enhance it’s features at the “Feira Nacional do Vinho Português”, the Wine Tasting Fair. Selling your wines to Portuguese local hangouts, will establish a market presence for your company and will help you secure the funds to expand your company, and to pay your enologists’ salaries. 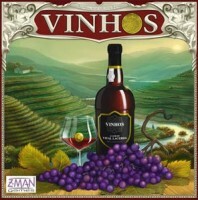 Vinhos is a magnificent game by designer Vital Lacerda, vintage 2010, for 2-4 players. Under the guyise of Portuguese winemakers, players strive to gain the most victory points over a period of six years by developing estates, selling wines, earning money, and winning illustrious wine fairs. Vinhos is a beautiful game with spectacular artwork. The board, although overwhelming at first glance, drips with wine-making theme, and the individual components add small doses of flavor and immersion. The game’s components come in two varieties: wooden pieces and cardboard tokens. The wooden pieces come in five distinct flavors: cubes for tracking Renown, cylinders representing the Taxation Marker and player Action Markers, meeple-people representing the Enologists (wine scientists) that may be purchased in-game, discs to track players’ positions on various areas of the board, and – most thematic of all – wine barrels to mark certain actions taken within the game. The cardboard tokens – of which there are many – are printed double-sided on good quality, thick cardboard. In most cases, the two sides relay different information, so it is not just duplicated imagery. With the exception of the Wine Feature markers used at the Wine Fair, the cardboard components are all nicely sized and well-suited to each token’s intended purpose. The Wine Feature markers, on the other hand, are small, round tokens, reminiscent of a disposable punched-out portion of some other token. I fear these four tokens to be easily misplaced or lost and have replaced them with more thematic and larger objects in my own game (namely miniature wine bottles). The Wine Quality markers, the second-smallest of the tokens, prove less troublesome in play. They are printed red-wine on one side and white-wine on the other, simplifying the matter of finding the needed value without the additional burden of also having to match color. There are also plenty of them. Even when playing a four-player game, I have never come close to running out of a particular value. Money in Vinhos comes in the form of Bagos and is represented by rectangular, dollar-like tokens in denominations of 1, 2 and 5. The tokens are small, giving no substantiality to the acquisition of cash in the game, but it is functional, and as it is difficult to hoard cash, its presence need not be more substantial. Still, the Bagos components could be easily substituted, and metal coins or more impressive “cash” might enhance the gaming experience. The Vinhos board is iconography-driven and, essentially, language-independent. Although it will take a new player some time to become completely comfortable with the iconography, the limited number of available actions and activities in the game prevent the iconography from becoming ornerous or overbearing. Though a thorough understand of the rules is needed by at least one player, the game can be taught to new players well-enough simply by explaining the action spaces and their associated iconography. The Vinhos rulebook, itself, is colorful and well laid out, with useful illustrations and ample examples. The rules are clear and concise, but there are a number of areas where the complexity and nuance of the game may cause confusion or simply go overlooked. These areas require a careful reading (or multiple readings, even) to get a firm grasp on them. In particular, the use of the Wine Managers and their bonus actions is core to game play, yet may be the most “complex” and intimidating aspect of the game for a new player. This area should be thoroughly understood. • When performing the Sales and Export actions, a player is not limited to selling or exporting only a single barrel of wine. • At the end of the game, after the final Wine Fair, players take turns placing barrels on the various Wine Manager scoring areas. This may be done any number of times, so long as the player has wine and barrels to spare. • With the exception of divesting, all activities that affect banking either add to or subtract from the player’s bank account directly. The only way to get cash from the bank (other than divesting) is to perform a Bank action. Due to the amount of components that must be placed out on the board, it takes a few games to get setup under your belt. After that, it actually becomes fairly quick and easy, as most everything has its place. The wine and bagos (money) tokens generally sit in piles off-board. Initial player order can be determined by any means, but under the variant rules included with the game (which I encourage be utilized), the actual first player will be decided by vineyard purchase at the beginning of the game. Gameplay in Vinhos takes place over six years of game time, during which time players take turns performing actions. 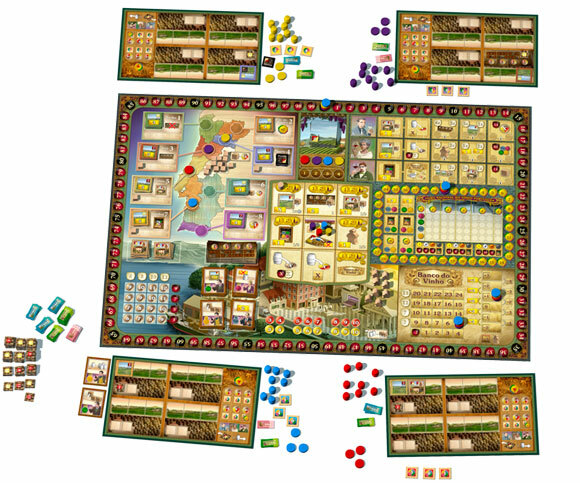 During each year, players are able to perform two actions, and the year is then followed by a banking/maintenance phase, and a wine producing phase. An additional Wine Fair phase occurs at the end of years 2, 5, and 6. This structure limits a game of Vinhos to 12 actions, although bonus actions can be obtained by establishing relationships with the Wine Managers and obtaining their services by expending wine. This is a crucial aspect of any sound strategy, as the Wine Managers can provide up to 10 additional actions over the course of the game (and possibly more at end-game scoring). There are nine actions available to players, which streamline the game very well. The Wine Manager bonus actions provide duplication or slight variations on six of these core actions. Each action is a self-contained and fundamental aspect of the overall game and none can truly be considered “optional”. Due to limited number of actions available during the game, maximizing efficiency by minimizing the number of times one performs each activity is an important consideration, as is the timing of when to perform any given action. With the exception of the Press Release, the individual actions are fairly intuitive and simple to use. Some of the activities may be performed a number of times when the action is selected, which, in most cases, is indicated on the board. The Press Release action, on the other hand, initiates several sub-activities and, for new players, may be the most “analysis paralysis”-invoking moments of the game. Vinhos is a game about victory points. In the end, it’s not who produces the best wines or who wins the most fairs that determines the winner, but rather who garners the most victory points. And victory points can be achieved in numerous aways. This is both a pro and a con for the game. For those players that enjoy multiple tactical and strategic choices for victory, Vinhos delivers; but for those players that new a more defined path to victory, the myriad options can be daunting. Furthermore, some victory points are scored immediately, in a “first come, first serve” or “winner take all” fashion, where others only score at the end of the game based on overall performance. This adds a degree of “use it or lose it” mentality to decision making, particularly in the late game, and may also dictate a need to block other players by taking a position that scores you few victory points, yet might otherwise win them many. The variety of the vineyards leans toward certain styles of play which, along with the multiple paths to victory, insures Vinhos a degree of replayability. Vinhos is a very thematic game and the wino in me can’t help but want to pour a large glass of Cabernet or Reisling (I know, not Portuguese) prior to game play. The fixed number of turns limits game time to a suitable degree (although “analysis paralysis” can still rear its ugly head), and a two-player game can be undertaken in under 90 minutes. Although the publishers must consider plastic baggies as suitable storage (as they included a handful of them in my copy), the number of components included in the game make Vinhos beg for custom storage. A few small- or one medium-sized modular storage case should suffice. Vinhos is a fun and enjoyable game for any number of players. Though the obstacles and strategy of a 2-player game differ from that of a 3- or 4-player game, then fun and satisfaction is in no way diminished. Complex, if you like that kind of thing. Playing time 2 players < 90 minutes. Heavy.and intimidating to new players. Complex, if you hate that kind of thing. Playing time 3-4 players > 2 hours. Add a Review for "Vinhos"